John was born in 1886 in Niederwurzbach, Saarland, Germany. 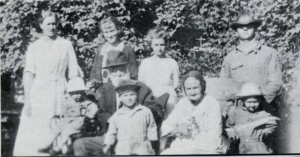 John's father was Freiderich (Fred) Wilhelm Dahlem and his mother was Catharina Kunckel. His paternal grandparents were Johann Dahlem and Frederike Elizabeth Lindelman. He had six brothers and two sisters, named Frederick, Charles, Henry, William, August, Jacob, Catherine and Lena. He was the youngest of the nine children. He died at the age of 82 in 1968.